Looking for a classic lunch idea? Brace your taste buds, friend! This epic low FODMAP grilled cheese is so good you’ll forget it’s low FODMAP! There’s something about a crispy grilled cheese sandwich that makes any meal feel a little magical. 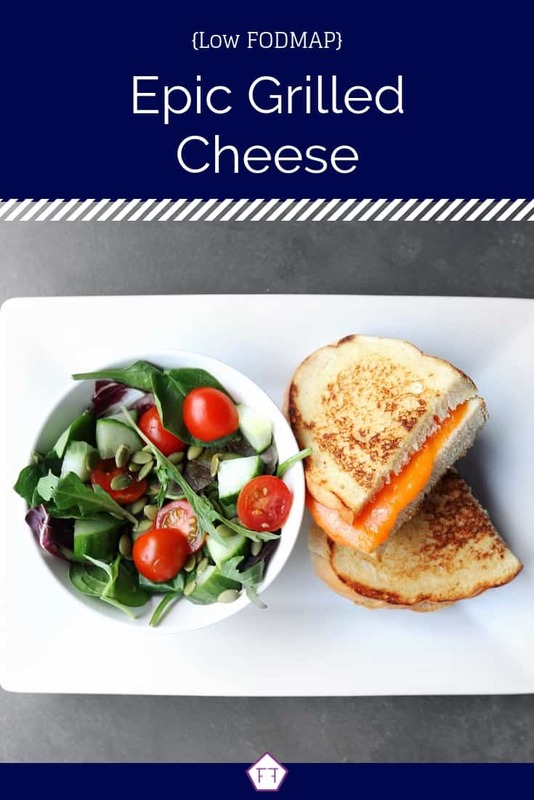 While there are a shocking number of opinions about what makes the “best” grilled cheese, this version is an Agur classic! The first time I had this grilled cheese, I was at a friend’s cottage. Apparently, my husband and his friend have been making this for years. While the recipe is simple, the results are epic. Hopefully, it’ll be a hit at your house too! While you can use any low FODMAP bread, I highly recommend using day-old sourdough bread. Sourdough adds a subtle tangy flavour you’ll love! Using day old bread also adds a little extra crunch and makes sure too much mayonnaise isn’t absorbed by your bread. 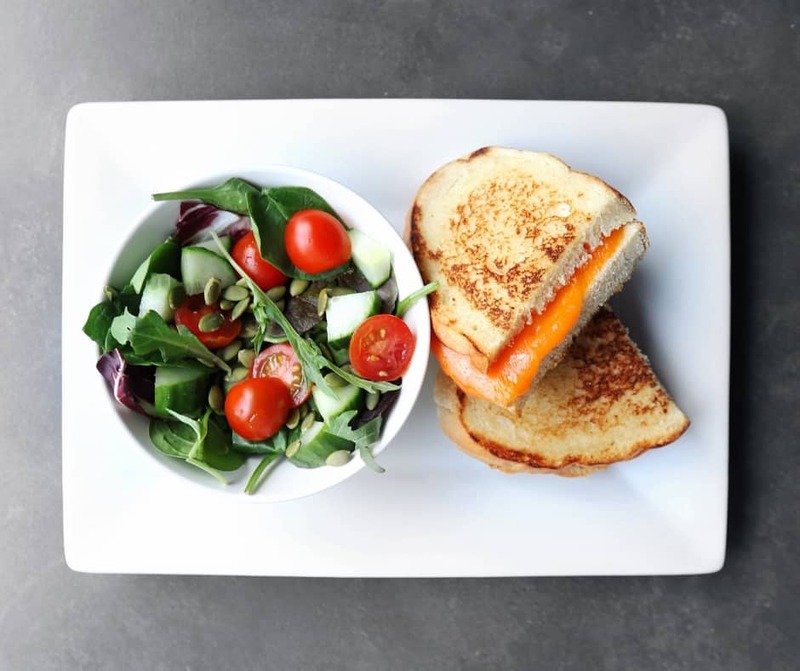 Think this epic low FODMAP grilled cheese sounds great, but you don’t have time to try it now? Don’t worry! You can PIN THIS POST for later. Looking for a classic lunch idea? Try this epic low FODMAP grilled cheese! Check out the notes below for tips on keeping this recipe FODMAP friendly. First up is mayonnaise. Traditional mayonnaise is made with oil and eggs. So, technically mayonnaise is low FODMAP. However, lots of companies add high FODMAP ingredients to improve the shelf life and taste of their products. If you’re having trouble finding a low FODMAP mayonnaise at your local store, you can make your own in under two minutes. Grab the recipe here. Next up, bread. You have some options here. You can either use a low FODMAP gluten-free bread or use long-rise sourdough bread. According to the Monash app, gluten-free bread is low FODMAP in servings of 2 slices (62 g) per serving. While sourdough bread is safe in servings of 2 slices (109 g). You can find instructions on finding long-rise sourdough bread here. Last but not least, cheddar cheese. According to Monash University, cheddar cheese is low FODMAP in servings of 2 slices (40 g). But, they don’t list a maximum serving size. You can read more about what Monash has to say about eating cheese on a low FODMAP diet here. Think your grilled cheese looks a little lonely? If you’re a soup and sandwich person, try pairing your sandwich with this classic tomato soup. Or, change it up and try this tasty roasted red pepper soup. If you’re too hungry for soup, try pairing your grilled cheese with these savoury potato wedges! 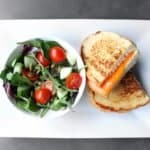 Want to try this epic low FODMAP grilled cheese? Don’t forget to PIN THIS RECIPE for later! Looking for a simple lunch idea your whole family will love? This epic low FODMAP grilled cheese is so good you'll forget it's low FODMAP! Heat a small frying pan over medium-low heat. Spread mayonnaise on the outside of two pieces of bread. Place one slice of bread in your frying pan and stick your cheese on it. Once the bread is nice and toasty, stick the second slice on your sandwich (mayo side up) and flip it over to toast the other side. Cook to your desired crispiness. Serve warm! This epic low FODMAP grilled cheese is so good, you’ll forget it’s low FODMAP! Did you like this recipe? Don’t forget to share it! Together we’ll get the Low FODMAP Diet down to a science! Low FODMAP Pulled Pork Looking for some FODMAP friendly comfort food? Made in the slow cooker and slathered in homemade BBQ sauce, this low FODMAP pulled pork will cure any craving! Low FODMAP Chicken Fingers Looking for a fun lunch idea? Crispy on the outside and tender on the inside, your whole family will love these easy quick and easy chicken fingers. Low FODMAP Buffalo Chicken Wings Whether you’re gearing up for game day or settling in for a cozy backyard BBQ, these easy buffalo chicken wings will be the talk of your table.